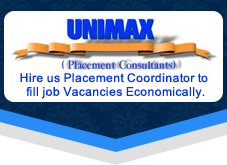 Located in Faridabad, Haryana, India, UNIMAX (Placement Coordinator) is known as a reliable and notable HR Consultant. Owing to our strong foothold in the industry, we help clients to hire worthy candidates for companies. Our services will help you hire the reliable human resources and being a prominent HR Consultant, we will benefit your company in the staffing process. We will make your recruiting process much easier and convenient. We cater to varied industries such as Engineering, Pharmaceuticals, Event Management, Sales & Marketing, FMCG Telecom/ Technology/ISP, Manufacturing/Operations, Medical/Health Care, Education/Training, Construction, Tour & Travel, Automobile, Technical, and many more.